Consider the following imaginary scenario. *Coal is the fuel of the future, we must mine more. *CO2 regulations are too costly. *Climate change will be good for agriculture. In addition, the report contains some questionable scientific statements and associations. Imagine further that the report contains a preface authored by a prominent scientist who though unpaid for his work lends his name and credibility to the report. How might that scientist be viewed by the larger community? Answers that come to mind include: “A tool of industry,” “Discredited,” “Biased,” “Political Advocate.” It is likely that in such a scenario that connection of the scientist to the political advocacy efforts of the oil and gas industry would provide considerable grist for opponents of the oil and gas industry, and specifically a basis for highlighting the appearance or reality of a compromised position of the scientist. 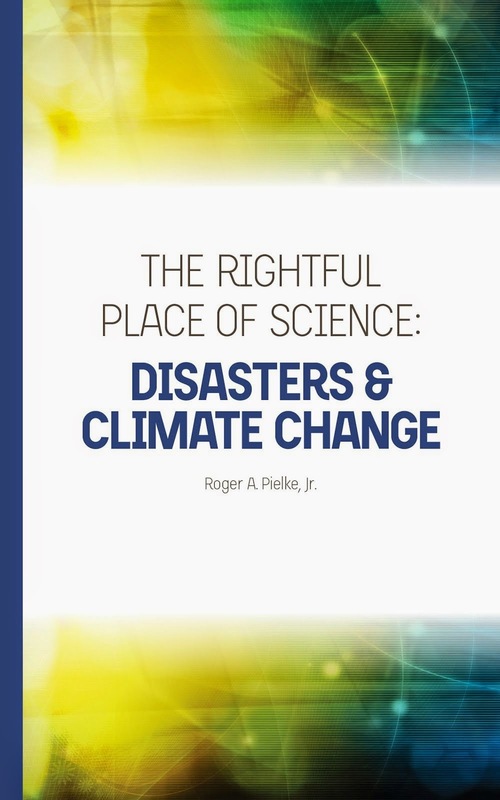 The report contains numerous references to specific weather events from 2004 as being caused by and evidence of human-caused climate change, which stretches the science to some degree (at least as assessed by the IPCC). And here, finally, I get to the main point. The report has a forward written by R. K. Pachauri, Chairman of the Intergovernmental Panel on Climate Change (IPCC). The IPCC has adopted as a mandate an objective of being “policy relevant, but not policy prescriptive” (what this means is actually unclear). It is troubling that the Chair of the IPCC would lend his name and organizational affiliation to a set of groups with members engaged actively in political advocacy on climate change. Even if Dr. Pachauri feels strongly about the merit of the political agenda proposed by these groups, at a minimum his endorsement creates a potential perception that the IPCC has an unstated political agenda. This is compounded by the fact that the report Dr. Pachauri tacitly endorses contains statements that are scientifically at odds with those of the IPCC. But perhaps most troubling is that by endorsing this group’s agenda he has opened the door for those who would seek to discredit the IPCC by alleging exactly such a bias. (And don’t be surprised to see such statements forthcoming.) If the IPCC’s role is indeed to act as an honest broker, then it would seem to make sense that its leadership ought not blur that role by endorsing, tacitly or otherwise, the agendas of particular groups. There are plenty of appropriate places for political advocacy on climate change, but the IPCC does not seem to me to be among those places. Let me also be clear on my views on the substance of report itself. Organized by the New Economics Foundation and the Working Group on Climate and Development, the report (in PDF) is actually pretty good and contains much valuable information on climate change and development (that is, once you get past the hype of the press release and its lack of precision in disaggregating climate and vulnerability as sources of climate-related impacts). The participating organizations have done a nice job integrating considerations of climate change and development, a perspective that is certainly needed. More generally, the IPCC suffers because it no longer considers “policy options” under its mandate. Since its First Assessment Report when it did consider policy options, the IPCC has eschewed responsibility for developing and evaluating a wide range of possible policy options on climate change. By deciding to policy outside of its mandate since 1992, the IPCC, ironically, leaves itself more open to charges of political bias. It is time for the IPCC to bring policy back in, both because we need new and innovative options on climate, but also because the IPCC has great potential to serve as an honest broker. But until it does, its leadership would be well served to avoid either the perception or the reality of endorsing particular political perspectives. Back to the blogging break for me ... please tune back in in a few weeks ... Happy midsummer! Egypt's Revolution: Not About the Price of Food?